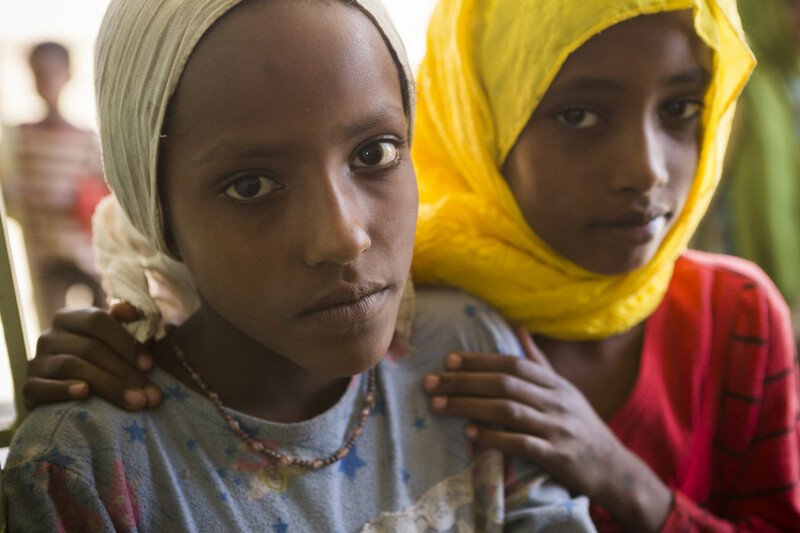 Caption: Alfiya and Ayisha, 10, stand outside a ChildFund supported health center in Koto Baloso, Ethiopia. Photo by Jake Lyell. The damaging effects of malnutrition caused by lack of food is a cruel, incremental process that deprives the body of its required level of nutrition to the point where the body starts to suffer damage. It is particularly damaging for children’s early development, and if is not reversed it will ultimately endanger their life. That is the stark reality facing millions of people in Ethiopia right now. Large swathes of the country have been severely affected by drought and one of the worst El Nino weather events that people can remember. Disruption to the weather system upsets the delicate balance of life. Rainfall can be severely reduced, or absent for dangerously long periods. For countries like Ethiopia where most people live off what they can grow or trade, this scenario can be hugely destructive, and ultimately life-threatening. This is the scenario that has been visited upon them before, with tragic results, and its happening again now. Two years of diminished rainfall have caused crops to wither or die and livestock to grow scrawny. 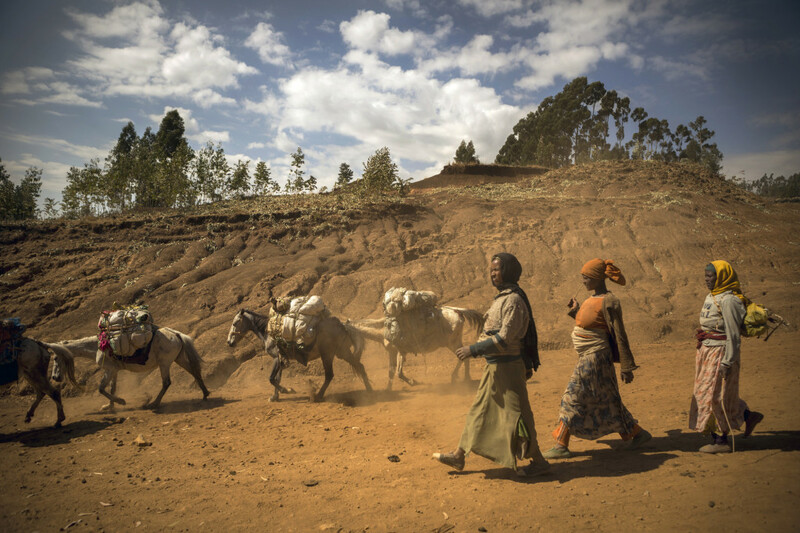 Caption: Community members from Adberwelia, Ethiopia travel to a market in the town of Kibet. Photo by Jake Lyell. Over the past year Ethiopia has witnessed failed Mehere (Summer) and Belg (Spring) rains. With no immediate change in the weather pattern forecast, and available reserves of food running low, it is predicted that the June – September period of 2016 will be extremely challenging for families already struggling to stay healthy and stay alive. An estimated 10.2 million cannot meet minimum nutritional levels are already in need of humanitarian food assistance. It is estimated that there are currently some 435,000 SAM (Severe Acute Malnutrition) cases and up to 1.7 Million MAM (Moderate Acute Malnutrition) cases. 3.6 Million people are in need of emergency and disease control support, as many as 5.8 million are in need of WASH (Water, Sanitation & Hygiene) support to help thwart the potential for disease to spread . These are frightening statistics by any measure and show the severity of what is facing Ethiopia and its people, now, and in the moths ahead. Approximately 300,000 people are affected by food insecurity in areas of Ethiopia where ChildFund operates. Some 104,000 of these are particularly vulnerable; children under the age of five, lactating and pregnant women, and the elderly. Sourcing safe water remains a pressing concern that affects entire families and whole communities. Children and their carers are being forced to wander further and further afield to find available water sources. Many of those places, such as small rivers that also service animals, are not safe for human consumption. Untreated water can carry dangerous water borne diseases. The affect of children is multi-fold. The priority of sourcing water and the long, exhausting and sometimes dangerous trips that can involve walking for several miles and the carrying of heavy water containers has become the dominant feature of many children’s day. This has seen education considerably disrupted with absenteeism now a big problem for schools. The lack of water is acutely affecting Fentale, Boset, Dugda and adjacent districts in particular. In a six month period to March 2016, ChildFund has supported a total of 26,637 people suffering malnourishment. Of these, 15,616 were children under five, 7,751 pregnant and lactating mothers, and 3270 are elderly. In this period ChildFund provided 310 metric tons (MT) of supplementary foods, 284 MT of Famix (a concentrated powder that includes maize, peas and soya beans that provides crucial carbohydrates and energy), and 26 MT of edible oil. ChildFund is currently implementing a UN funded scheme called Community Based Management of Acute Malnutrition (CMAM) designed to reduce the potential for child mortality, and reduce the rate and frequency at which children might acquire debilitating illnesses such as diarrhoea or respiratory disease (Morbidity) by reaching as many SAM children under five as possible and providing them with in-patient and out-patient treatment programmes. ChildFund is continuing to liaise and work in partnership with other international aid organisations to target assistance to those worst affected in ways that can help them. You can help support ChildFunds work to assist children and their families in Ethiopia by supporting our Food Crisis Appeal .